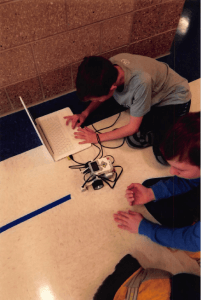 Students learn computational thinking and problem solving skills by working together as a team to design a robot, and then solve puzzles and challenges by programming their robot to complete specific tasks. We will be using Lego Mindstorm EV3 kits. During the winter semester they will prepare for the Robotics competition sponsored by the Engineering Department at BYU. Classes will start the week of Feb. 25, will meet two days/week for six weeks, and the competition will be held Saturday, April 13 on BYU campus. Only 5th and 6th graders are allowed to compete and will be formed into teams of 2-3 members. Click here to see a video of the Spring 2019 Line Following Challenge. Melanie Hall is a parent volunteer who has worked with the robotics teams the past few years and we will also have BYU mentors from the BYU Engineering Department to help coach the teams.